A strong effort from Johan Santana and (in my opinion anyway) first-half MVP Angel Pagan helped the Mets salvage the final game of the “first half” today, and allow them to reach the break at 48-40, and four games out. Make no mistake they will need a better second half to reach the postseason but given all the uncertainty, and how badly they’ve looked at times, I think they pretty much deserve to be where they are right now and you have to be satisfied with it. Their ability to improve depends in large part on whether Carlos Beltran is ready to resume his usual game. The Mets following the victory Sunday recalled No. 15 and he’ll apparently be in uniform and batting cleanup on Thursday when the season resumes in San Francisco. Jesus Feliciano, who oughta be proud of what he accomplished, was sent down to make room. 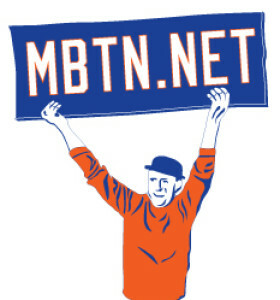 Don’t forget today — Monday, July 12, is Amazin’ All-Star Monday at Two Boots at Grand Central Station, where Greg Prince and I will co-host an evening of Met-centric discussion with Howard Megdal, author, journalist and self-professed candidate for Mets general manager; and Marty Noble, Mets beat writer for more than 30 years at the Bergen Record, Newsday and MLB.com. Details at the Facebook invite here. Submitted by 9th_string_catcher (not verified) on Tue, 07/13/2010 – 10:34am. Much more than I expected. Very proud of usually cursed superstar Angel Pagan; hopefully he won’t go down in the second half. Still, unless Reyes is healthy, we’re in big trouble. Also, we’re way behind on getting 9 catchers on the roster by year’s end, but we’re almost halfway there. Submitted by gored82 on Tue, 07/13/2010 – 11:48am.